We have developed a new synthetic biology tool called Control of Lineages by Barcode Enabled Recombinant Transcription (COLBERT) to address this challenge. Control of lineage-specific gene expression by a gRNA-barcode system enables activation of a reporter and isolation of a specific lineage of interest from within a high diversity population. The platform can be generalized to control expression of any gene in a lineage-specific way. Acquired resistance to cancer chemotherapy is a major cause of treatment failure and a longstanding clinical challenge. While many experimental models of resistance have relied on long-term selection of resistant clones, here we wanted to examine the onset of resistance following exposure to a short pulse of chemotherapeutic agent. We hypothesized that on this time scale, cells may evade treatment by switching into different heterogeneous gene expression states. There are no specific markers to identify all of the cells in resistant and sensitive states. 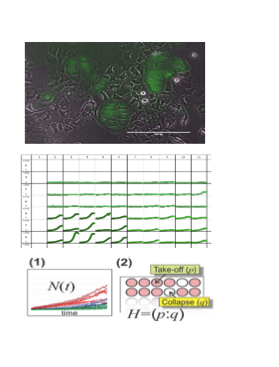 To address this challenge, we use a linked experiment and mathematical modeling approach to estimate the relative frequencies of cells with different drug sensitivity states over time. Several hundred measurements were collected to assemble a dataset on the long-term dynamics of doxorubicin resistance in breast tumor cells. Using model selection, we demonstrate that a multi-state model of heterogeneous cell subpopulations best captures our changes in chemosensitivity over time. The approach we describe here uncovers chemoresistant subpopulations in breast cancer cells and is generalizable to any system in which subpopulations may play a role in a dynamic measurable outcome. While many models of tumor growth have focused on the late stages of tumor expansion, the earliest stages of tumor initiation and growth have not been well characterized. Growth dynamics at very low cell densities are of utmost clinical importance, as the ability of these cells to enter the exponential growth phase leads to new tumors and metastases. We hypothesize that the key principles that govern early stage tumor growth are analogous to ecological principles that describe the expansion of a species in its environment and the role of subpopulation interactions on population growth. These principles are explored through in vitro study and mathematical modeling. We anticipate this work will reveal insights into the requirements for interactions among cancer cells at the early stages of tumor initiation. Understanding these early stage dynamics may enable therapeutic rationales to consider manipulating population dynamics to disrupt interactions and ultimately prevent tumors from establishing.